Have you met…Dennis Michael Jones? sometimes I hope that you will see that this is what is meant to be, 56″x 40″, sumi ink, acrylic, latex, paint marker, spray enamel on 2) 28″x 40″ Lennox print paper, 2013. The person I’d like to introduce is the artist Dennis Michael Jones. 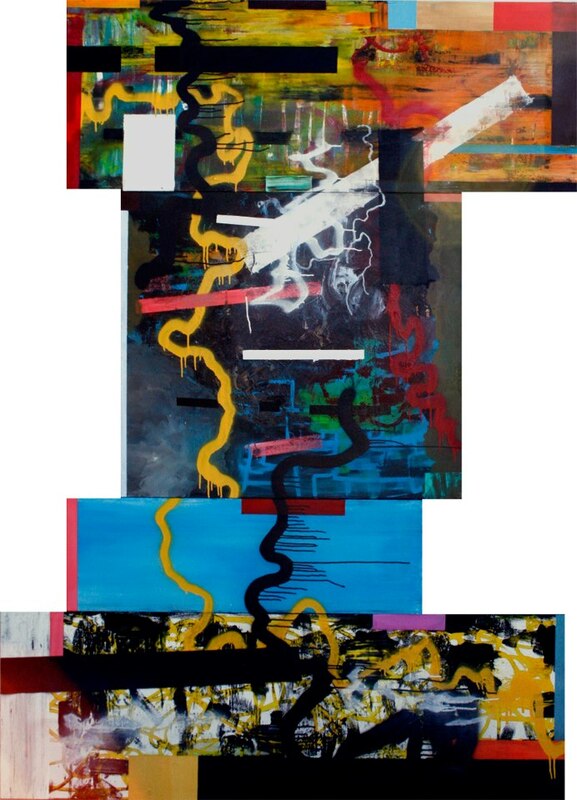 sometimes it’s all of this, 84″x 60″, acrylic, spray enamel, paint marker on four canvas panels, 2013. “Over the past seven years I have focused primarily on the use of text in my work with an integration of words and objects developing several thousand pieces with many including the direct interaction of viewers. I’ve found that a process of relinquishing control and sole authorship is influential and fruitful. The grouping of works here speaks to this output and recalls the viewer’s input. The scribbled, scrubbed, stained and blanked out areas of color are deletions that provide openings for the insertion of new thoughts and reaffirm discovery through painting. I think of these paintings as liminal spaces between writing/ language and image/object. It’s not about a painting’s resolution; it’s about the intriguing ambiguities discovered along the way. 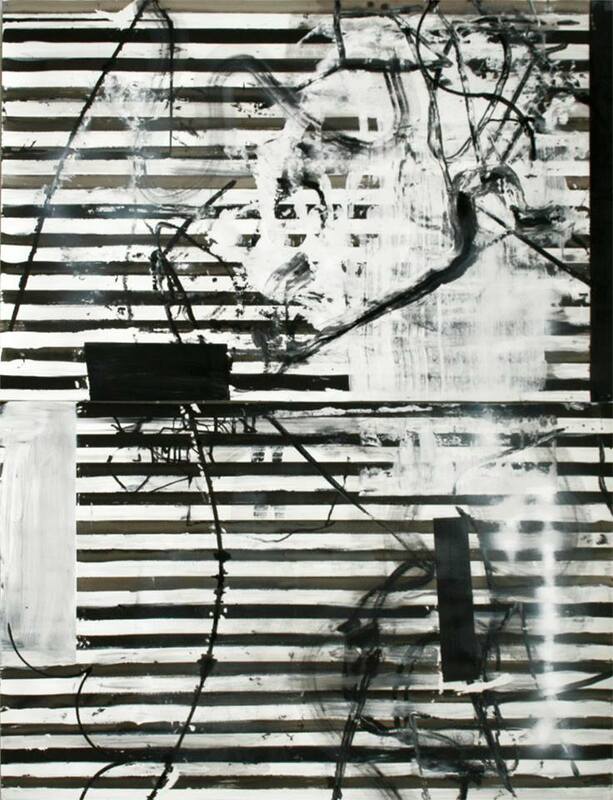 sometimes it’s one thing after another, 68″ x 86″, acrylic, latex, spray enamel on four canvas panels, 2013. Dennis Michael Jones lives in Plymouth, Michigan, United States. 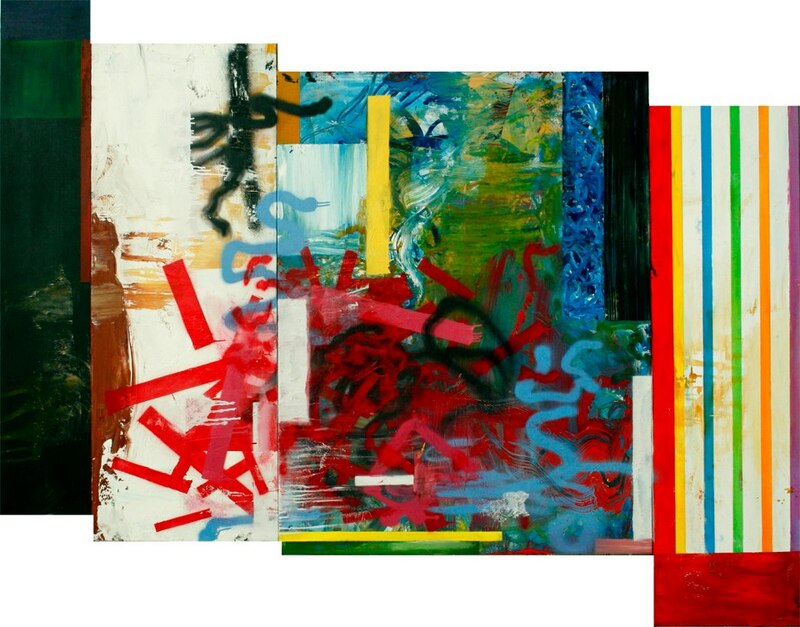 sometimes you don’t have to understand, 36″x 90″, acrylic, latex, spray enamel on three canvas panels, 2013. Other Material Relating to Dennis Michael Jones. Art Gallery of Windsor: Dennis Michael Jones. Youtube: Word to Image. Dennis Michael Jones. This entry was posted in art, Have you met...and other lists. and tagged abstract, abstract painting, American painting, art, Contemporary art, contemporary painting, Dennis Michael Jones, drawing, painting. Bookmark the permalink.